What kind of crazy cat won’t Cruz to Los Gatos for dinner? Not me. When I’m feeling frisky, I make a fe-line to Manresa. There are S M and L options for dinner. Peruse the menu and choose three or four courses ($66/$80) or go (as we did) for the Seasonal and Spontaneous Tasting Menu ($110) which requires the participation of the whole table. Atmosphere: people are dressed “business casual” (I wonder if there is a dress code called “business monkey”? I’d like that.) The room has warm tones and wood paneling. Accents of apples and flowers finish the effect. The style of service is warm and casual but well choreographed. These savories in desserts clothing were sheepishly wolfed down. The tender sugar coated clown nose of a starter was a nice contrast to the slightly chewy, and delicious shell shaped, olive cake. 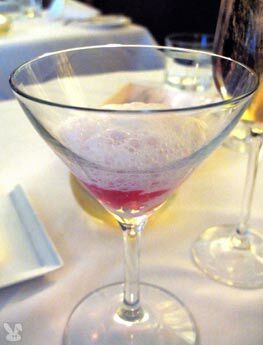 Citrus salad with rhubarb gelee under a horchata foam was a refreshingly tangy palate slap. 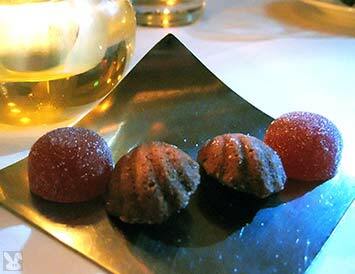 These came alongside a disproportionate serving of sweet butter and a little ant hill of sea salt. Easy assembly, crisp and creamy, this got us off to some smooth saline. We were instructed to dig all the way down into the Arpege egg to get the combined flavors of the yolk, maple syrup and crème fraiche with a hidden layer of chopped chives. 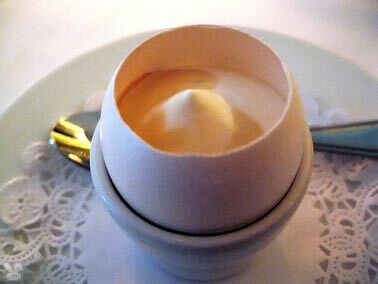 The effect was a rich, sweet and salty breakfast in a shell. 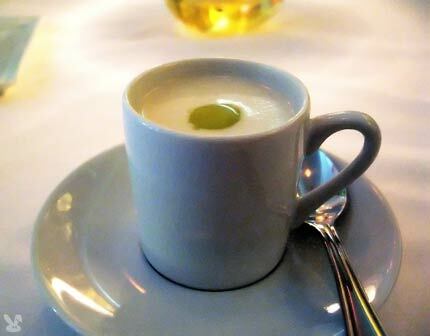 An oil dotted demitasse contained a foie gras mousse covered with a cauliflower crème. 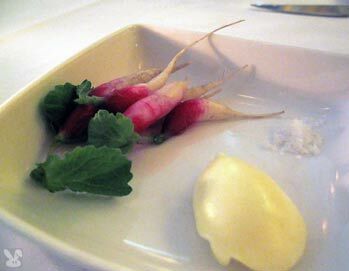 This was surprisingly light (for such heavy sounding components) with complimentary flavors and creamy textures. 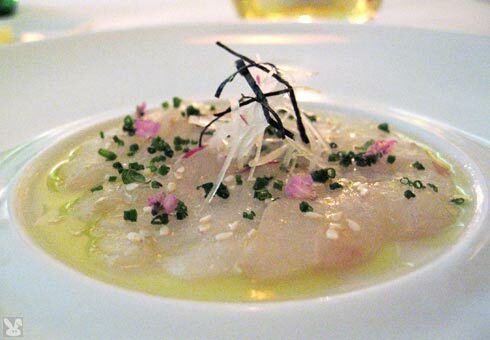 Perfection on a plate arrived as sea bream with extra virgin olive oil, chives, sesame seeds, radish and nori. The clean, precise, flavors made me bream. Halibut cheeks were battered and deep fried. Instead of chips, there were haricot verts and slivered olives. The sliced olives acted as a salting agent for this lemon sauce laced dish. Although good, the variations of textures verged on too subtle due to the lack of crispness in the beans or the fish batter. 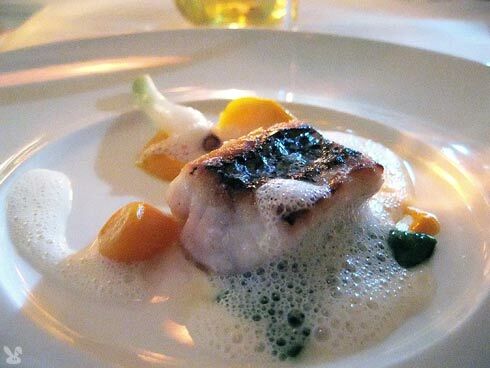 The Black bass answered my crisp craving with a nicely seared skin. 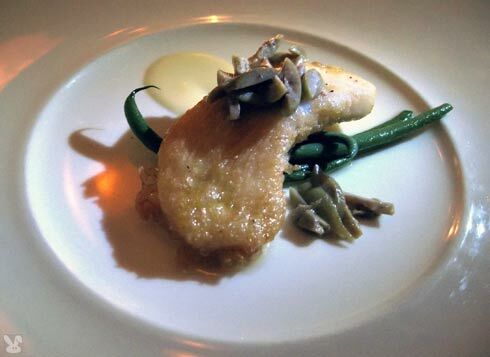 My personal taste leans towards fish that is cooked rarer than this particular dish. The white wine foam laced together the sweet carrots, wild onion and snap peas all of which were cooked slightly further than my personal preference. 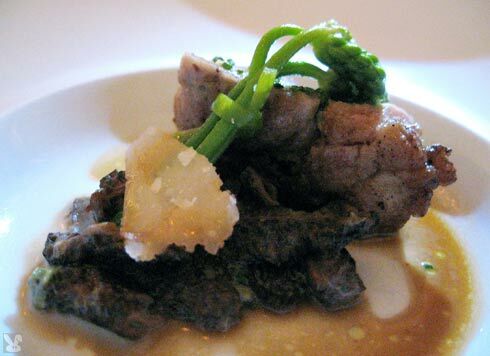 These perfectly cooked sweetbreads were delicately complemented with the umami factor of morels and parmesan. The wild asparagus bundle spearheaded this dish to the top. 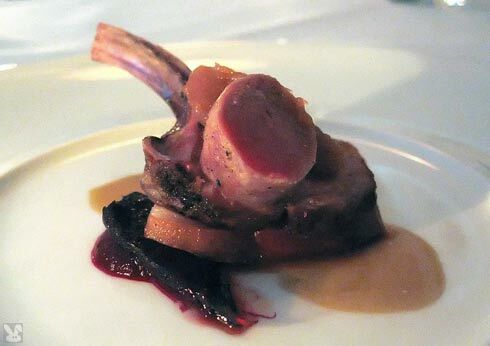 A pork chop over greens with baby beets was bone gnawingly good. The crisp edged meat was a bacony bonus accented with fennel and apple. 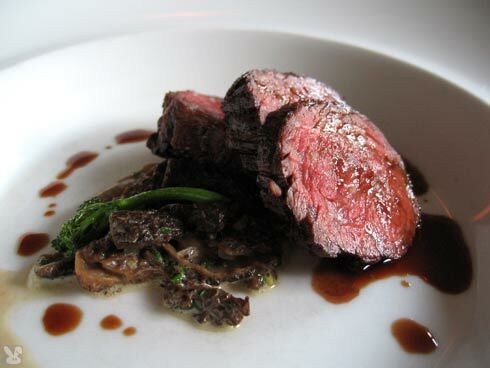 Beef bavette was like eating a liquid cow. Tasty and mouth meltingly tender, it was served with more morels (not something I’m used to having a lot of) and broccoli raab. There was a bit of a shoyu based sauce to lasso the flavors together in this bovine dish. 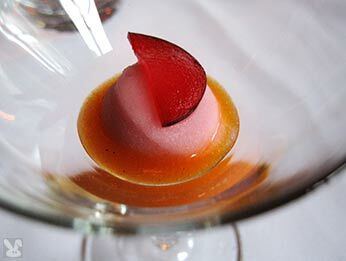 A fruity 1-2-3 came in the form of apricot puree, white peach sorbet and a slice of plum. This chilly, slightly sweet and acidic wake up call was a pleasant priming of the dessert pump. Numi makes these cool pop up sponges that are actually plants that flavor hot water. They don’t turn into giraffes doing the hula or the Eiffel tower, they look more like sea anemones. I got the red carnation which ordinarily makes me think of tinned milk or meeting a stranger to get murder information in a train station, but these thoughts were washed away by this delicate, floral tonic. Gutenberg got the Peony which looked like an Outback Steakhouse Bloomin’ Onion that fell behind a radiator and was discovered a few years later (but it tasted much better.) 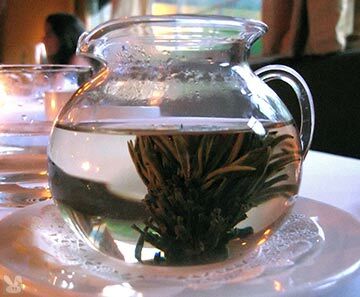 This black tea was full bodied enough to counteract the girly, floral fragrance. 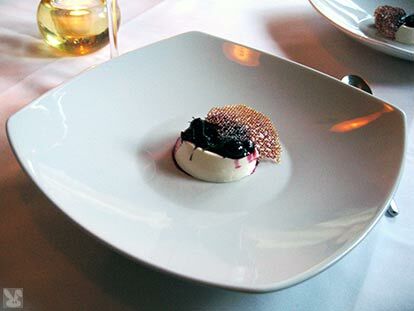 Meyer lemon panna cotta with blueberries was a mini volcano erupting with a chiffonade of basil and a crispy, virgin tuile sacrifice. 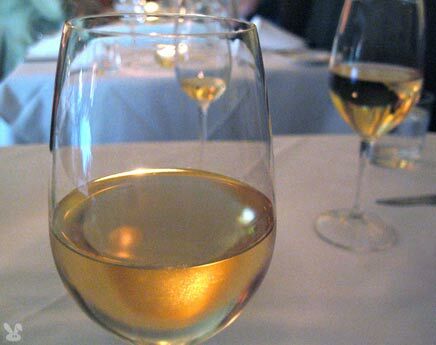 The creamy, fruity, herbaceous tastes were lavable. 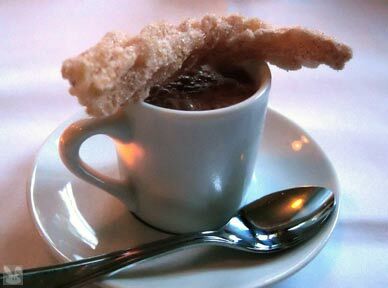 More lemon arrived in the form of a citrus scented, sugar-cinnamon dusted, churro and a demitasse of chocolate soup. I anticipated a richer soup, but I guess my arteries benefited from something thinner than 50w flowing their way. 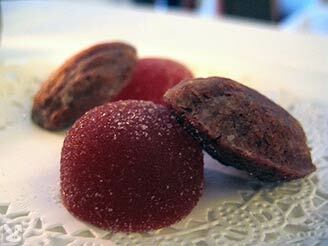 A strawberry gumdrop and chocolate Madeline took us full circle. If we were in an old time movie theatre I’d say, “this is where we came in”. meal in our Daily Feed blog. 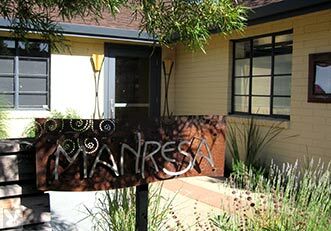 So click the link to see even more Manresa chow. Bathrooms are blue tiled, clean and well stocked.